Bus Stop Shelters now include commercial lighting, solar power and LED lighting technology. With the rising cost of oil, liability issues and ecological concerns, schools and individuals are turning to public transit as an effective means of transportation. As a result of this explosion in mass transit usage, bus stop shelters are becoming more prevalent. One of the main concerns that patrons express is the lack of protection from the weather that they face while waiting for a bus. This can largely be circumvented through Easy Rack modular shelters for the use of passengers while they are waiting. What should I look for in a quality bus top shelter? There are many things to consider when choosing the right bus stop shelter, and while many of these factors will be determined by the prevailing weather conditions in your area, others will necessarily come down to the budget available to you for providing the service. Some modular buildings and guard shelters are fully enclosed for more harsh environments and others have open sides for warmer climates. All models have solid roofs and wall dividers that provide shelter from the sun, snow and rain as well as seating for resting your weary feet. What can I do to prevent vandalism to my bus stop shelter? It is a sad fact of life that bus stop shelters and temporary pre-fab modular buildings are frequently abused by vandals, so choosing a modular bus stop structure that is resistant to vandalism is paramount. Easy Rack suggests using shatterproof glass and a minimum amount of furniture as a way of minimizing economic loss. The best form of loss prevention is simply giving people a good looking bus stop shelter or modular structure that instills pride and satisfaction to the community. What maintenance upkeep do bus stop shelters require? Bus stop shelter benches made of corrosion resistant aluminum are preferable to plastic or even steel systems, as they last longer, and despite the higher initial cost, offer a better long term solution to keeping passengers comfortable while they wait. They require less maintenance and only need an occasional power wash to keep them looking good. The same method of maintenance works well for tempered glass panels and the roof on any pre-manufactured portable building. What is the best way to provide lighting at my bus stop shelter if I have no power available? One of the latest innovations in bus stop shelters is commercial lighting technology and introduction of solar power and LED lighting components. During the day, batteries are charged up from the power of the sun, and then at night, this power is discharged for the lights. It is a very cost effective solution to providing security lighting and making users feel more safe and secure. Also, solar powered lights reduce construction costs by eliminating the need for convention power requirements. 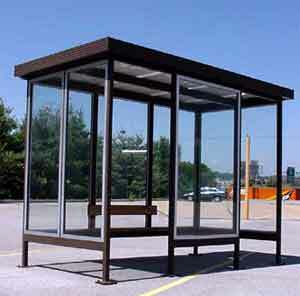 Where can I purchase modular bus stop shelters? Easy Rack has been selling modular bus stop shelters, modular buildings and installing all types of material handling supplies and equipment for years. Easy Rack technicians will travel nationwide to any major city to service our valued commercial clients. Whether you live in New York City, Los Angeles California, Chicago Illinois, Houston Texas, Philadelphia Pennsylvania, or even Phoenix Arizona, Easy Rack will dispatch trained staff to your area. Call toll free at 888-776-3720 and let us assist you today!